Rival rallies have taken place in Budapest over the appointment of an actor, known for his far-right views, as director of a prominent theatre. Gyorgy Dorner was picked to direct the New Theatre in October by the mayor of Budapest, Istvan Tarlos. He is associated with the far-right Hungarian Justice and Life Party. The party was set up by a playwright, Istvan Csurka, in 1992 but no longer has MPs. It has now largely been eclipsed by another far-right group, Jobbik - Movement for a Better Hungary - which won nearly 17% of the vote at the last elections. "We want to use our own tools to make it possible to say proudly, I love my country, I am a Hungarian, a Christian Hungarian, and I live according to European Christian moral values," Dorner said in a recent chat show on Echo TV. The new director, who has also contributed the Hungarian soundtrack to Bruce Willis films, insists he will put on only plays by Hungarian authors and with Hungarian directors, in order to "instil a sense of patriotism in the audience". Istvan Marta, the director of the New Theatre (Hungarian: Uj Szinhaz) for the past 13 years, told the BBC that the appointment was "incomprehensible - part of an absurd, even tragicomic drama". During his time in office, he staged around 90 plays, of which about half were by Hungarian authors. "Theatre is about openness to the world," he said. "But what he is trying to do is to close it to the world. This would not be possible in France or England or Germany." Several actors at the theatre have already announced their intention to quit, others are uncertain what to do. In response to the uproar, the mayor has asked Gyorgy Dorner to drop two features of the tender with which he won the post. These are his intention to rename the theatre the Hatorszag, or "Hinterland" theatre, which has militaristic undertones in Hungarian, and his plan to install Istvan Csurka as artistic adviser. The mayor has also said he will review his decision after a year - even though Gyorgy Dorner's contract is for five years. Hundreds of mainly liberal and leftist protesters occupied the narrow streets in front of the New Theatre. A rival group of 200-300 members of the New Hungarian Guard and Civil Guard for a Better Future - both linked to Jobbik - gathered in the boulevard nearby. The two sets of protesters were kept apart by riot police. "I tell our skinhead friends, we are Hungarians too, and that we are also here so that the future will be a bit better for them as well in our country," one of the speakers at the rally, lawyer Daniel Peter told the crowd. "Because the hatred that they represent in bigger and bigger numbers leads nowhere." "I came to protest against the anti-fascists," said Laszlo Attila, 41, a spokesman for the rival, uniformed protest, from the southern town of Bekescsaba. "We wholeheartedly support the appointment of Gyorgy Dorner. At last a Hungarian theatre has a boss who believes in the Hungarian nation." He might now even start going to the theatre himself, he said. Similar groups affiliated with the far-right were banned, after they marched through largely Roma-populated ghettos in rural Hungarian towns and villages. But the two far-right groups at this rally are "completely legal" according to Laszlo Attila, who said they had arrived by bus from all over Hungary. Just why the centre-right Fidesz government allowed the appointment of such a controversial figure as Gyorgy Dorner is a mystery to many Fidesz supporters, while critics of the government say it is proof of collaboration between Fidesz and the far right. "This is not a government, but a metropolitan issue," Deputy Prime Minister Tibor Navracsics told the BBC last October. 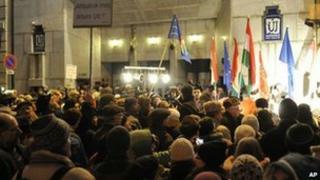 "This was a decision of the mayor of Budapest, and we should not interfere... with the autonomy of the city council. So let us see who are the stronger - the supporters or the protesters."